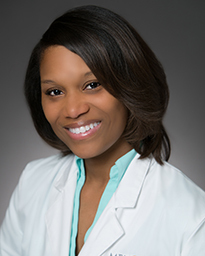 Dr. Tametra J. Garnier received her medical degree and completed her internship at Louisiana State University Health Sciences Center in New Orleans. Following her internship, Dr. Garnier went on to complete her residency at Houston Methodist Hospital. Board certified in obstetrics and gynecology, Dr. Garnier treats female patients ages 13 and older. She has extensive experience in managing obstetrical complications such as preterm labor, preterm rupture of membranes, and high blood pressure and diabetes in pregnancy. Her clinical interests include minimally invasive surgery, such as hysteroscopy, endometrial ablations, traditional laparoscopy, as well as robotic assisted hysterectomies. Dr. Garnier ensures her patients feel comfortable and understand their medical plan thoroughly before leaving her office. She strives to care for each patient as if they were a member of her own family. In her spare time, she enjoys spending time with her husband and three boys, as well as traveling. Dr. Garnier practices out of MHMG Specialists for Women.